In an ideal world, we could sail through life debt-free. But, it doesn’t work like that for most of us. We need a mortgage to pay for our homes; buying a new car outright is not an option, and we must finance. Sometimes emergencies happen, and we need to whip out the credit card. Carrying debt isn’t bad in and of itself; it comes down to the type of debt, how much of it you are carrying, its impact on your life, and how it makes you feel. We are talking about the type of debt that is not necessary, and has resulted from irresponsible spending that always seems to keep us behind the eight ball. 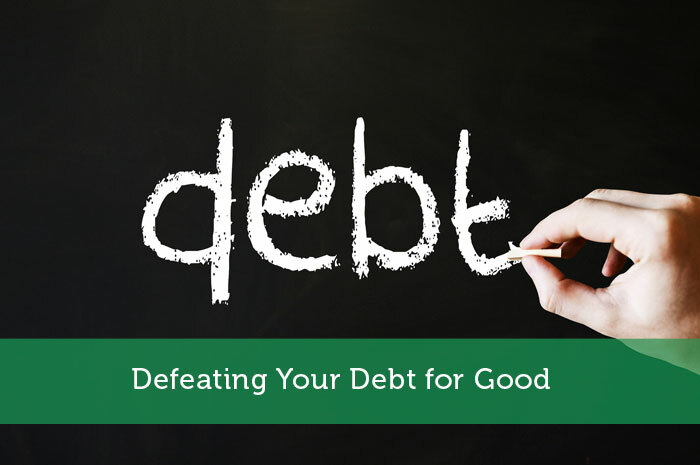 If you are ready to defeat your debt for good, here are some helpful tips to get you started on the road to better financial health. Your debt problem has been something that has been eating away at you for quite some time now, hasn’t it? You know you need to do something, but you felt a bit overwhelmed. When you think of how long it would take to pay off, it seems so far away until you are free from this albatross. The amount of money left over each month to put towards this worthy goal just seems so small, it doesn’t make you feel good, so you just haven’t bothered. You tell yourself when your car is paid off, or when you go after that higher paying job next year, you will get serious about chipping away at what you owe. Don’t wait for this undetermined point in the future to start dealing with this problem; commit to taking action right NOW. Work out a budget, and see how much you can realistically put towards your debt at this moment, and start doing it. This decisive act will be a very strong motivator, and you will feel good. No matter how small that amount may seem, it is better than nothing. When we take up tasks that can seem kind of hard, or where we may not see significant results for awhile, finding ways to stay motivated and feel good about what we are doing, are absolutely crucial. So, when it comes to devising a strategy, pick the one that would give you the most psychological boost. For some, it might be starting off with the smallest balances and knocking them out of the way—seeing that credit card with a big fat zero as the balance can really be uplifting. Or, perhaps you like the idea of starting with the largest debt that is weighing most heavily on you. Some people like the idea of consolidating debt, and just having that one payment to deal with each month—if you go this route, it would be a good idea to look into cards with 0 interest to whittle away that number as fast as possible. If you do consolidate, however, you must develop the discipline to not use the cards once the credit has been cleared from them—if you really don’t think you can do this, consolidation may not be the smartest idea. Where are You Sabotaging Your Finances? If you want to seriously pay down your debt as quickly as possible, your whole financial life is going to need some serious examination, and perhaps a complete overhaul. You want to be able to put as much money towards your debt as possible–without creating a feeling of extreme sacrifice. Being overzealous with a budget is the first step to failure. So, you need to see where you are sabotaging your finances. Where are your financial blind spots? Are you spending too much money going out to eat, when you know you should be cooking more? Do you get a little crazy with weekend outings? Do you turn to the mall when you need an emotional boost? The better you understand your money habits, the more effective your solutions will be. If you follow these tips, you are on the road to ridding yourself of debt for good. I can’t say “thank you” enough to folks who advise people to pick the debt pay off strategy that works for them. We are all different, with different incomes and expenses and debts, and sometimes we will need to do things our own way in order to make progress. In our own case, we have around 10 student loans. Three of them are teeny tiny. One of them is around 30k and has the highest interest rate. Until recently, we had no extra money to throw at debt, so we were looking at selling things, etc to start paying off debt. Had we stuck blindly to paying off the highest interest rate, the things we sold would barely make a dent. But (for us) it would make sense to pay of those small loans in order to gain traction on the big loans / high interest rates. We are all different and I’m so glad when writers remind people to do what is right for them! Pick a Strategy that Gives you the Most Psychological Boost, that’s the one I think is the most important because most of the time it’s psychological rather than physical effort of paying off the debt. Sabotaging your finance is the first reason why you can’t pay off your debt. Solving this problem must be a top priority! I’ve always tried to pay off my credit card balance each month so I never really worried too much about my credit card. However, I’ve found that psychologically using my credit card takes a bit of the pain out of spending, which isn’t always a good thing. Despite earning some rewards with my credit card I’m opting to use my debit card when possible just so I feel the pain of spending a little bit more! I’m not a fan of debt. Period. I have a mortgage and it’s the only debt I have and I’m working as fast and hard as I can to pay it off. The issue that a lot of people don’t take into consideration is risk. If you have debt then you have risk. But definitely hit those debts hard people! Life become so much more liberating when you are not shackled by debt. Agreed! Just do _something_ is the hardest and biggest step. Debt can seem like a unclimbable mountain, but once the process is demystified it becomes possible! Picking the strategy with the most psychological boost is huge. I always say that paying off the debt with the highest interest rate is the smartest move finance wise, but the overall goal of getting out of debt is more important. Find the option that works for you and stick with it, no matter what anyone else says. Very good points. Stop the self sabotage and then find the method that works best for you! Also transferring to 0% interest cards isn’t a bad idea for someone carrying a huge interest rate, but typically there are balance transfer fees involved. And of course the time line is important as you mentioned, because you could be back up to high interest before you pay it off. The important thing when determining your strategy is to take an honest look at your situation, getting educated on ALL your options for eliminating your debt, and then picking the right solution for your specific situation. That initial first step of admitting I had a “problem” and wanting to take care of it was probably the hardest part for me. I tried to get started a few times, but once I was finally “sick and tired of being sick and tired” as many say, I was finally able to make the change and get the debt paid off. Paying off smaller debts offers me great psychological boost— every time!